If you want to reduce plastic and waste in your kitchen there are endless opportunities. You might already line your bin with newspaper instead of plastic bags, or buy dishwashing liquid, soap and multipurpose spray refills from your local bulk food store. Good on you... keep up the great work!! On the 12th March I emailed Finish about their dishwashing tablets. I asked about the ingredients that are used and their environmental impact, if they have considered using packaging that wasn't plastic and what the outer layer of the tablet (the bit that dissolves in the wash) is made of. I have sent a further three follow up emails and no answer to my questions. It's annoying being the annoying person that keeps pestering for answers but I feel like I have to do it. Pentasodium Triphosphate, Polyvinyl Alcohol, Fatty Alcohol Alkoxylate, Sodium Carbonate, 6-(phthalimido) peroxyhexanoic acid, 2- propenoic acid, homopolymers, sodium salt, sulfonated, Ethylenepropylene oxide copolymer, Aqua, Sucrose, Sodium Sulfate, Oryza Sativa Starch, Proplene Glycol, Protease, Zinc Sulfate, Benzotriazole, Tetrasodium Etidronate, PEG-130 - PEG-150, Dimethicone, Perfume, Amyase, Colorant. No ingredients are listed on the package of dishwashing tablets. Instead, you will see this: "CAUTION! KEEP OUT OF REACH OF CHILDREN. IRRITANT. Risk of serious damage to eyes and skin... Wear eye protection/ face protection." WT???!!! I have never seen anyone wear eye protection or gloves when popping a dishwashing tablet into their dishwasher. But the label says we should. There is the disclaimer. I pasted an edited version of my original email in the 'contact us' link on the finish website so will see if I get a response. Anyway... I am clearly not perfect... I have these dishwashing tablets in my cupboard. They are so convenient and clean the dishes so well... in fact when I think about it they even clean the colour off my mugs and plates. I just didn't realise what they were made of. I ignored the CAUTION (which is the only indication on the package that it's most likely horrible for the environment and our health). I chose convenience and didn't bother or have the time to look into it. I have read this before and it's an easy thing to remember. When buying food and household products, if you can't pronounce an ingredient, or the ingredient list is massive and or full of numbers, or there is no ingredient list... DO NOT BUY IT!! Most of us are not chemists and do not understand what these high tech ingredients are. Ignorance is not bliss... it's ignorance and I am guilty of that and trying to make up for it now. These DIY dishwashing tablets clean your dishes and contain three ingredients. Be sure to scrape off the food from your dishes first as advised by ALL dishwashing tablet suppliers! These are fun to make with your kids, it's like a science experiment as there is a bubbly reaction!!! Step 1. Add all ingredients into a bowl and mix. Step 2. Use your hands to mix well. It will fee like shaving cream! Step 3. 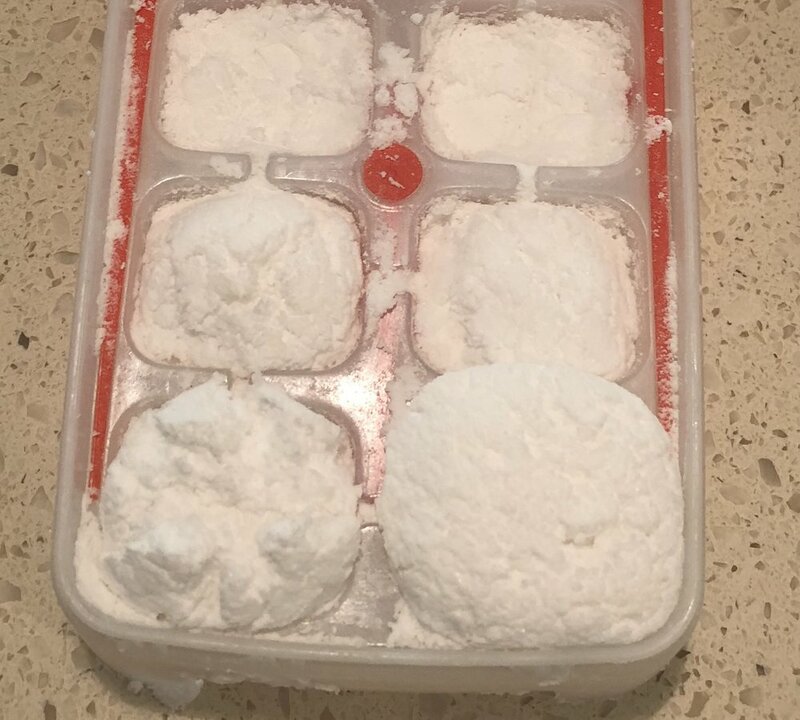 Fill an ice cube tray, This one has a silicone bottom which made it easy to pop them out later. The mixture continues to expand and froth up, so leave for 10-15 minutes. Push the mixture down and scrape off any excess. This can fill another cube. Mix will stop expanding, then you can leave them to harden over night. Pop them out and store airtight in a jar. You could probably add a few drops of citrus essential oil if you want your dishes to have a scent, but I don't bother. Chemical and plastic free! Yes!!!! !